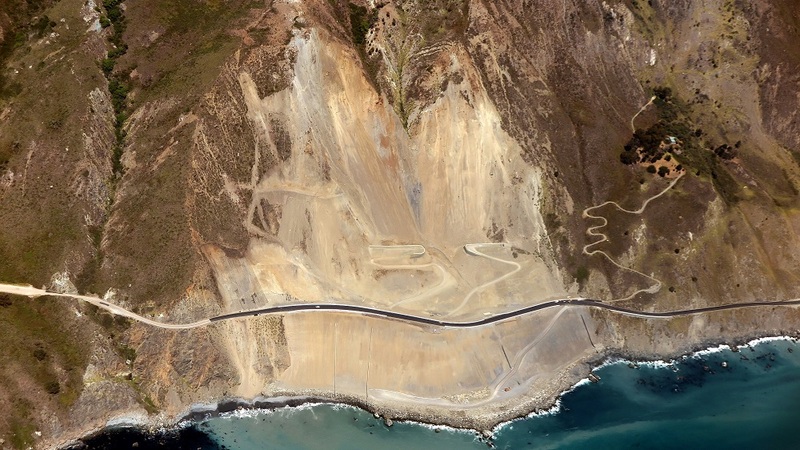 MONTEREY, Calif. (CN) – For the first time in more than 14 months, motorists can once again drive the entirety of iconic Highway 1 along the Big Sur coast – and catch a great view the 15 acres of new coastline created by a massive landslide. After the biggest landslide in the recorded history of Big Sur wiped a chunk of Highway 1 off the map in May 2017, Caltrans workers and contractors worked overtime to reopen the road two months ahead of schedule. “We had some long working days, some favorable weather conditions and in working with our crews and contractors in the last few months everything came together,” said Colin Jones of Caltrans District 5. The landslide at Mud Creek, just south of Gorda near the San Luis Obispo County border, moved more than 2 million cubic feet of land – burying the highway and altering the landscape. Replacing the stretch of highway carried a price tag of $54 million. Highway 1 saw several slides during the winter of 2016-17, one of the wettest on record for Big Sur and much of California. Torrential downpours of that winter also triggered a separate event that compromised the Pfeiffer Canyon Bridge. That slide led to the nearly seven-month closure of the bridge, during which much of Big Sur was effectively isolated from the rest of the world. The twin closures dented the business prospects of many restaurants, shops and other enterprises that operate along a stretch of highway accustomed to a steady stream of motorists eager to view some of the most breathtaking vistas on the planet. But with the bridge repaired and the highway to the south reopened, prospects are looking up. Russell credits Caltrans for opening the road about two months ahead of schedule, meaning the area can still take advantage of the high summer season that typically peters out in September. “They worked their forklifts off to get this done,” he said. Instead of unearthing the highway, Caltrans instead opted to build a highway on top of the slide. This means the highway now located a couple hundred feet to the west. Jones, of Caltrans, said the area continues to be dynamic, but the engineers fully expect the area to stabilize after a winter or two of more rain. The fact that motorists can drive from Morro Bay to Carmel for the first time in about 18 months has businesses in the southern reaches of Big Sur – places like Cambria, San Simeon and Hearst Castle – ecstatic. But the Mud Creek slide closure meant businesses to the south continued to struggle. With the highway open and dry weather in the forecast for at least the next couple of months, tourists, residents, business owners can all collectively take advantage of the open road – and a scenic one at that.